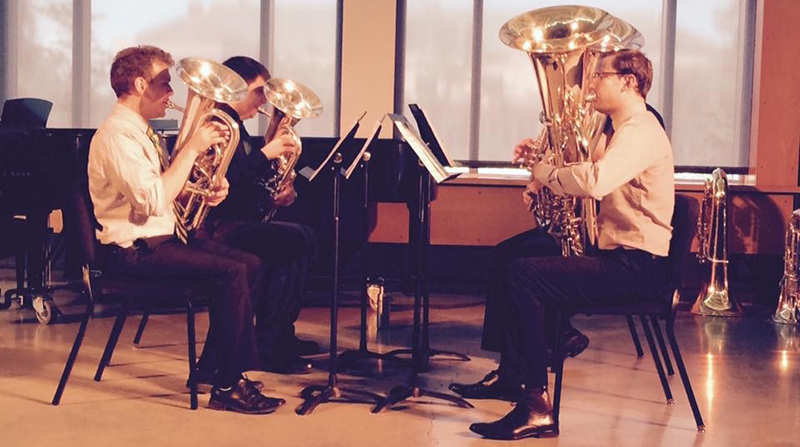 With notable wins at the 2016 International Tuba Euphonium Conference and selections accepted into the Society for Electro-Acoustic Music Conference, students at the UO School of Music and Dance continue to earn recognition on the world stage. While low brass was winning at the tuba conference in Tennessee, Future Music Oregon students studying at the music school’s Intermedia Music Technology Center are raising the school’s profile as a leader in music technology. This latest success adds to the growing list of awards the School of Music and Dance has gathered in the past few years. “This experience has given our students an excellent lesson in how committing oneself to the art and each other will result in success. I couldn’t be more proud of them for what they have accomplished this year,” Grose said. For an in-depth review of the recent achievements, see “In the Spotlight on an International Stage” on the School of Music and Dance website.